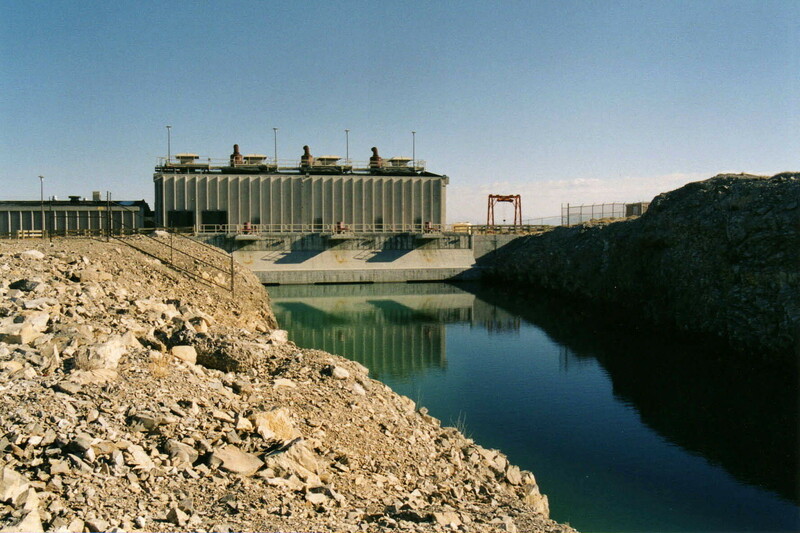 The West Desert Pumping Station is a series of three pumps designed to reduce the water level of the Great Salt Lake, the level of which had been rising steadily through the 1980s, threatening the shoreline industries, Salt Lake City International Airport, railroads, and even I-80 with flooding. The pumping plan called for a system to pump water from the lake to the adjacent Newfoundland Basin, located to the west. The south end of Hogup Ridge, a few miles further down the causeway northwest of Lakeside, was selected as the pump site, and six and a half miles of canals were dug to and from the pumps. Completed rapidly in less than a year, at a cost of nearly $60 million in state funds, the pumps went on line in April 1987. At the same time, a drought began, causing the lake level to subside naturally. The pumps were mothballed in 1989, and the settlement of trailers and manufactured housing, brought in to house the workers, stands vacant.